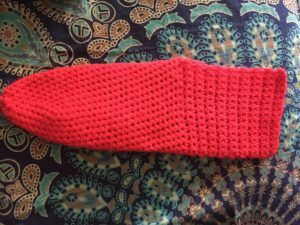 I started the Foot Warmers pattern last week as we waited for a snow storm to blow in. Both the snow storm and slipper pattern were a bit of a flop. It did snow, some, and the the pattern does make slippers, but neither were quite what was expected. 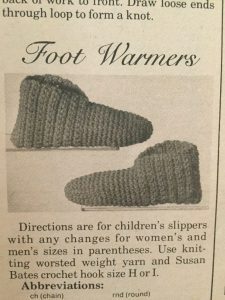 When I started the slippers I immediately noticed the math wasn’t quite right. There is a small error in the pattern. I gave it a very real thought that I was having a brain fart and sent the numbers over to my mom with a message of “crochet this real quick and tell me if it works” with the numbers for the first two rounds. It doesn’t. It’s a quick and very simple fix and then I kept going until a slipper was made. If you have this issue, March 1975, you might want to note in the margins that the round 2 numbers are incorrect. I’ve said it before and I’ll say it again, I have big feet. That does effect the finished look of my slipper. 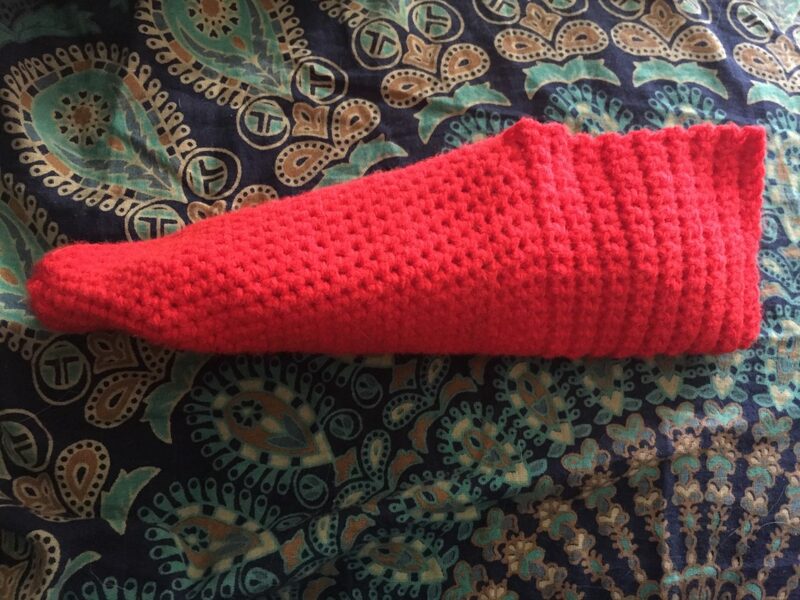 It looks like it should curl at the toe or something, it’s so long and skinny. I also did not end up with the higher back like the picture for the pattern shows. Not quite sure why. The pattern itself was simple enough. Though I wish I had attempted the men’s size, and the women’s is a bit snug in the toes for my large feet. I added my Super Easy Non-Slip Grip and have one slipper. I didn’t get a pair in time for the snow storm. So maybe it’s a good thing the snow storm was a bust. For the next 6/8/10 rounds increase twice per round in the previous increase stitches. You’ll end up with increases on each side of the toe bed. Just do your best, there is a little wiggle room here. Stop increasing and just SC evenly for length desired to fit the toes and front of the foot. Fold so that the increases are on each side and SC to the center top. CH 1, and then SC back to the opposite side to the center (now working a back and forth panel.) Repeat SC back and forth, with a ch 1 at the end of each row, until total heel length fits. Sew up heel seam. Any problems? Let me know in the comments and I’ll try to help! I’d love to know if you make a pair! Yes, I made the foot warmers. They don’t look great but they do keep the feet warm. I added a round of single crochet to make them a little higher on the ankle. I have a picture if you want me to send it. I’d love to see them! I just set up a contact page that you can use to email me. It’s still new, so I’m not sure if you can attach the photo, or if you’ll need to email and them send it to me after I respond.